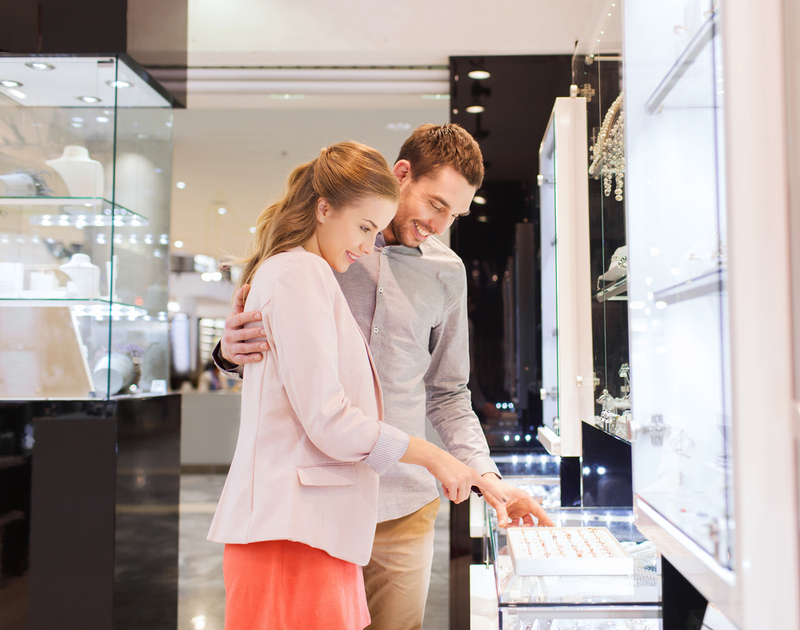 The shape of a diamond is a customer’s first priority when selecting a diamond for an engagement ring, wedding band or piece of jewelry, whether that is a pendant, bracelet or a pair of earrings. From the classic round shape to fancy shapes like princess or heart, decide the perfect shape for you. An important attribute of a diamond, the shape, which refers to the diamond’s physical form, is usually the first aspect a couple or individual considers when selecting a diamond for their engagement ring or wedding band. It could be dependent on personal taste, for an occasion like your wedding, engagement or as an anniversary gift, or what is trending in the world of diamonds. It could also be related to quality and value. 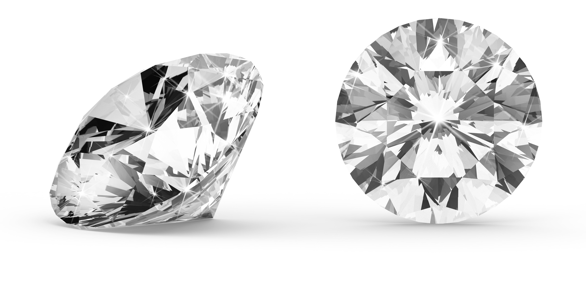 All diamond shapes are unique to each other, with distinct characteristics which determine the quality for each shape. 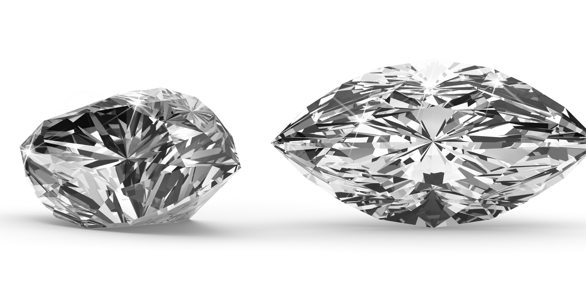 Each shape highlights the 4Cs of a diamond – cut, color, clarity and carat – in varying forms as well. And due to this, each diamond shape offers different forms of beauty, style and brilliance. 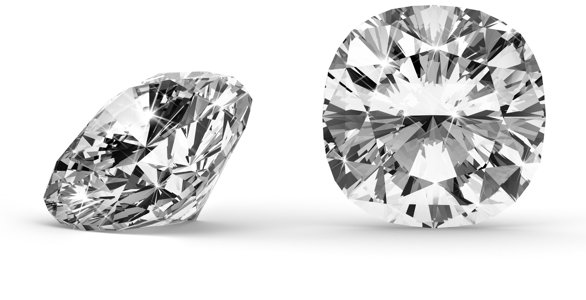 The term “diamond shape” is often confused with the “cut” of a diamond – one of the four Cs of a diamond. Each shape may be cut to different specifications, which impacts the overall beauty of the stone. However, the type of cut, or quality of it, is determined by different grades, which may or may not be dependent on the shape itself. 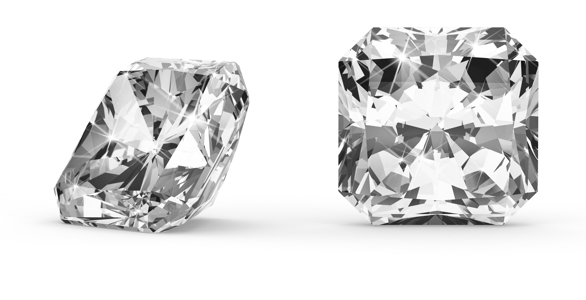 The “cut” of a diamond describes how well the diamond has been polished, and that determines the way light is reflected throughout the stone’s facet arrangement. It also determines light refraction, sparkle and scintillation. Uniglo Diamonds suggests to select a diamond with a cut grade of Very Good and above (Very Good, Excellent) to get maximum beauty and value for money. The diamond shape’s length-width ratio is also of importance. 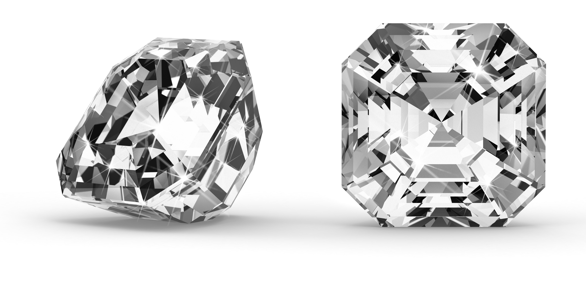 A greater length to width ratio implies that the diamond will be longer and skinny, while a lower ratio means the diamond is more circular/square in appearance. 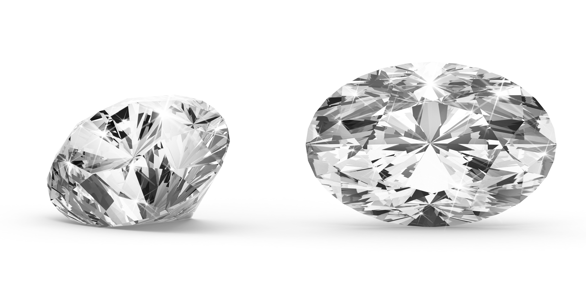 Round diamonds are the most popular and classic shape, however, many customers are equally attracted to the unique look of “non-round” or “fancy shaped” diamonds. 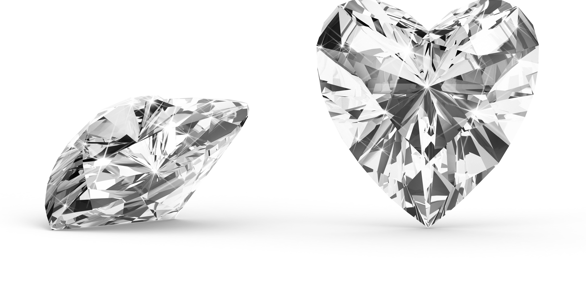 These diamond shapes include: heart, princess, emerald, cushion, asscher, radiant, oval, pear or marquise. Some diamond shapes cause the facets on the pavilion, or underside, to meet at a point, resulting in maximum light return. Other diamond shapes highlight the clarity of the diamond by the way they are cut, and feature parallel facets on the pavilion, resulting in a subtle shimmer while heightening clarity. Every shape has a story of its own, and a beauty unlike any other, just like every woman has her own unique style and personal taste. The round brilliant cut diamond is the most popular diamond shape. It is timeless, classic and can be applied to many versatile styled diamond rings, and therefor has the flexibility to facilitate many tastes and style preferences. After the round brilliant cut diamond, princess cut diamonds are the most popular fancy diamond shape. 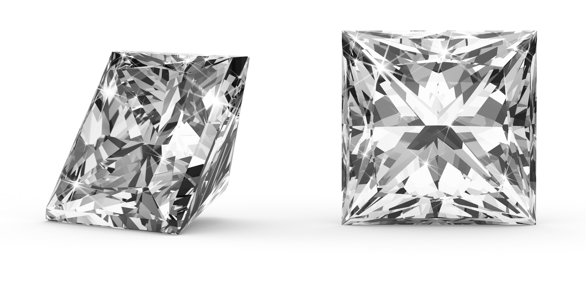 And similar to round cut diamonds, princess cut diamond are also a good choice for their versatility. The cushion cut combines the charm of a square cut diamond, but with soft, rounded corners, resembling a pillow. 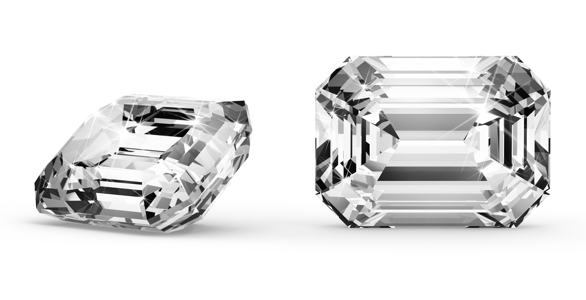 Cushion cut diamonds are a popular choice for their adaptability to any kind of diamond setting. Emerald cut diamonds feature a rectangular shape with truncated corners, and a broad flat plane that resembles stair steps if seen from a top angle. It has a shallow pavilion and crown, and this heightens the clarity of the stone more than any other diamond cut. The oval shape lies somewhere between the round brilliant cut, showcasing a similar fire, and the pear shape. Oval cut diamonds have an elongated shape which creates the illusion of them being larger than they usually are. The radiant shape is a unique shape because it combines the silhouette of an emerald cut diamond with the sparkle and fire of a round brilliant cut diamond as well as the depth of an emerald and princess cut. The asscher cut features a prismatic brilliance and square shape with cut corners. This diamond shape appears sleeker and showcases a more subdued sparkle than the star-like designed facets that you will see in round brilliant or princess cuts. The marquise brilliant shape looks like the hull of a small boat, featuring pointed ends with a curved middle. It has an eye-catching appearance and features a larger surface area than any other diamond shape. It can therefore, like oval shaped diamonds, maximize carat weight and appear larger than other stones of the same size. The heart shape, one of the most romantic of all shapes, is an unmistakable symbol of true love. It is one of the rarest of all diamond shapes. Comprising of two symmetrical halves, they offer a bold and shimmering appearance. 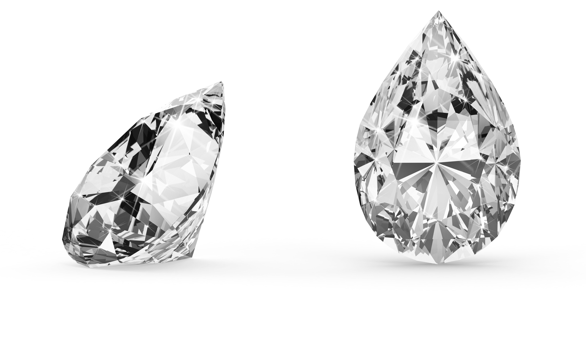 Featuring a round edge tapering to a point at the opposite end, the pear shape is a unique hybrid diamond cut which fuses the brilliance and design style of both the round brilliant and the marquise diamond cut. Shaped like a teardrop, the elongated shape amplifies carat weight and flatters small and slender hands very well. 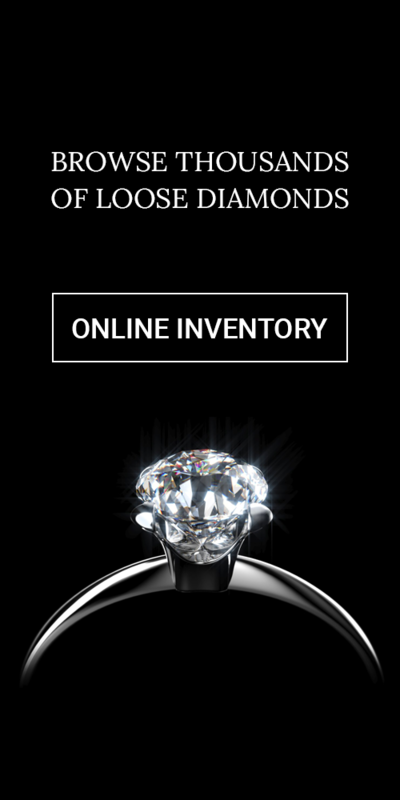 Uniglo Diamonds believes in educating every customer and catering to their detailed wishes. We seek to ensure that you are well-informed about every diamond shape available, and the best one to select basis your requirement – be it for an engagement ring, jewelry piece or a special gift. Our selection of beautiful shapes, along with detailed information regarding uniqueness and history, beautiful images and recommendations of the ideal cut will help you make the best decision.